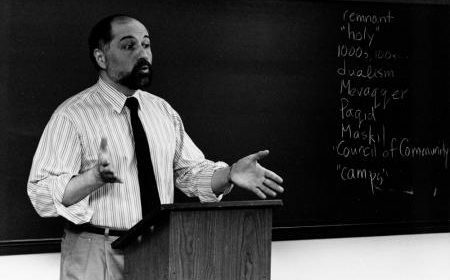 Professor Ted Pulcini, now in his final year at Dickinson, signed off to do an exclusive interview with WDCV FM. We sat down with him to discuss his 24 year long career, and asked him to do a little retrospective for us on his time here at Dickinson. Currently serving as the chair of the religion department, he’s pretty renowned for his classes. Professor Pulcini’s primary focus in academia is Abrahamic religions, but particularly Islamand early Christianity. Professor Pulcini is also a priest, and this other side of him has affectionately earned him the nickname “Father Ted” amongst people on campus, although he tries to keep his religious life and his academic life separate. That hasn’t stopped him from being a wonderfully wise man who gives fantastic advice to students (and this interview has some great gems of wisdom from him) when they ask for it. We at WDCV have really appreciated him reflecting on his Dickinson experience. Listen to him talk about how much has changed here since when he first began teaching here, as well as hear his own personal experiences outside Dickinson that have inspired and molded him into the academic he is today. Interview recorded March 7, 2019 by Nuhan Abid ’22 and Ellie Doblin ’21.